Gangsterism is often characterized as anti-social behaviour frowned upon by polite sections of society. There is no doubt that the behaviour of gangsters like Kortboy and Don Mattera in Sophiatown was despised by many as "anti social". Tom Lodge however, suggests that in a sense, gangs in Sophiatown can be likened to Eric Hobsbaum's "social bandits" that were a phenomenon of early British Industrial Revolution and the Capitalist system it spawned. And since Lodge's characterization of Sophiatown's gangs in these terms, they have been seen as part of the resistance rather than social outcasts to be viewed with contempt. Crime and violence were an important reality of urban life and culture. The poverty, misery, violence and lawlessness of the city led to the growth of many gangs. In particular, the numerous youth gangs or tsotsis reflected the instability of the urban African family. Parental control was largely absent as both parents were forced to work. Juvenile delinquency rates were extremely high. After the Second World War in the late 1940s, there was a large increase in the number of gangs in Sophiatown. Part of the reason for this was that there were about 20 000 African teenagers in the city who were not at school nor did they have jobs. Township youths were unable to find jobs easily. Employers were reluctant to employ teenagers as they did not have any work experience, and many of them were not able to read or write. They also considered them to be undisciplined and weak. In Johannesburg in the 1950s, crime was a day-to-day reality, and Sophiatown was the nucleus of all reef crimes. A black man could land in jail for lack of a pass; so to be called a criminal was no great insult. Gangsters were city-bred and spoke a mixture of Afrikaans and English, known as tsotsitaal. Initially, they relied more on their wits than on violence to manipulate the white system. As conditions in the townships worsened, they turned to robbery, muggings and other violent crimes. Tsotsis or gangsters were the small-time criminals. They often had "respectable" jobs during the day, but at night and on weekends they "supplemented" their income. A young tsotsi could easily earn as much as R10 a day, which was considered to be really big money. Some of the more well known gangs in Sophiatown were the Americans, the Gestapo, the Berliners and the Vultures. The names the Gestapo and the Berliners reflect the tsotsis admiration for Hitler, whom they saw as some kind of hero, for taking on the whites of Europe. The Gestapo grew out of a group of boxers who would fight each other on the weekends. They spent much of their time defending their territory and their women from their rival gang, the Berliners. They later turned to robbery and protection fee racketeering against Indian shopkeepers. The Americans were probably the flashiest and most well-known of the gangs in Sophiatown. They were led for a time by 'Kort Boy', a notorious gangster. Don Mattera remembers Kort Boy well. Bra Boy, as Kort Boy was fraternally known to the young prospective street-fighters, was a different man to different people, kind to his friends and admirers and cruel to his enemies - and since he had more of the latter, Bra Boy's reputation was that of a savagely cruel man. Newspapers and magazines such as Drum and High Note carried sensational monthly articles about his exploits. Kort Boy, whose real name was George Mbalweni, originally came from Benoni. He lived a violent life, and served a number of prison terms, once for killing a school principal; another for the murder of a rival gang member. Here, he was sentenced to death. However, his sentence was later commuted to eighteen years' hard labour. After fifteen years in prison, he was released, only to find the world much changed. The residents of Sophiatown had been removed and most of his fellow gang members were in jail or dead. In 1985 he had gotten a job as a messenger for a commercial company, and Don Mattera suggests that "his once proud and stubborn shoulders are now bent and subdued." The Americans dressed in expensive American clothes - elegant cardigans, brown and white shoes and narrow blue trousers called Bogarts. Because of their clothing they became known as the Americans. They started off from a group of brothers, cousins, and friends who were small-time pick-pockets and bagsnatchers. But as time went on, they became more interested in large-scale crime. They did not prey on the Sophiatown community; rather they stole from city shops and railway delivery trailers. They often exchanged gunfire with the railway police who suffered considerable losses as a result of theft. They were known by many as the "African Robin Hoods" because they robbed goods from the rich white men and sold them in the locations at very low prices. The Vultures was a huge child gang, started by Don Mattera. The Vultures imitated the adult gangs like the Americans, but it was also partly inspired by the movies. It took its name from a film called 'Where no vultures fly'. Like the older gangs, the Vultures were concerned with protecting their own turf - an area of land in Sophiatown which they considered to be their own territory. "Hy was die main ou of the outfit." Don Mattera was die main ou of the outfit, the bozza - the leader of the gang called the Vultures. He explains why he and his friends joined the gang: "the boys could be somebody at a time when society did not help them to be somebody." 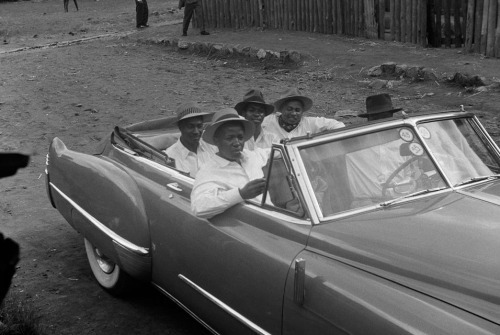 Belonging to a gang could not change the injustice of the society in which they lived, but it provided the youth of Sophiatown with a strong sense of identity and belonging. They were also a real challenge to the police and the authorities who found them difficult to control. The raw mineworkers were very easy victims for the tsotsis, and so for self-preservation they grouped together in a gang. They called themselves the Ma-Reshea -the Russians and consisted of Basotho migrants. They transported their rural values and dress into urban setting. Ma-Rashea always wore Basotho blankets over their smart city pants, and smart hats with an ostrich feather. Tsotsitaal - Tsotsis or gangsters spoke tsotsitaal which was a mixture of Afrikaans and English, but also borrowed heavily from American slang. It eventually became the language of African working class culture and was spoken by mostly by workers.